Just a quick post to let you know pixelberg has been updated to be compatible with r20. The shop has the latest version for new customers and the vip members area files have also been updated to include a r20 build. Any issues or bugs found with the r20 build please let me know. Installation of plugins for r20 differs from previous versions as plugins can now be installed anywhere as long as that location is in or added to the c4D->Edit->Preferances->Plugins->SearchPath setting. For simplicity though i would recommend just creating a plugin folder in the c4d main directory and placing it there (by default there is no plugin folder created in r20 release). PixelBerg has been updated to 1.9 and is available to buy and download now. I am pleased to announce that version 1.9 of PixelBerg is finally available. If you are a VIP member you will find PB 1.9 in your VIP members download area. It has a few changes and fixes over the last prerelease which are detailed bellow. For other or new users the store has been updated with the latest version and you can purchase and download it from there. Just a quick note to give you a heads up. I will make another post on 1.9 closer to official release which now will be around the release of C4D r18 (as r18 is so close it makes sense to hold off a bit and include an r18 build). 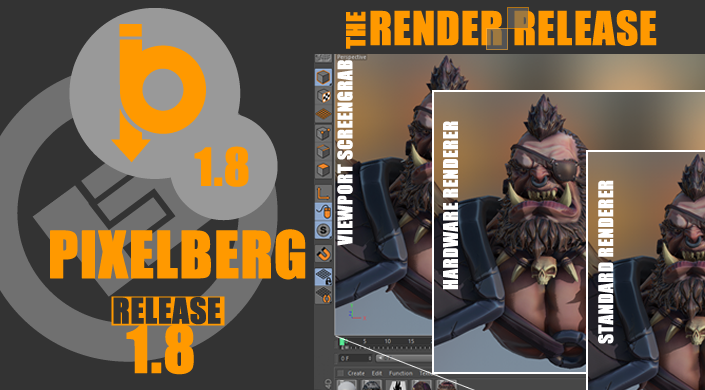 I will also give some more information on what i have been up to, why there has been a bit of delay between 1.8-1.9 and future direction and new features of PixelBerg. You will also notice the website get a fresh look and some new features in the next few weeks. - You will find it in "VIP Members Area/PixelBerg C4D/pre releases" folder in your vip download area. PixelBerg has been updated to v1.8b and is available to purchase now. As a way to say thank you to those who pay the recommended price and to try and encourage more to do so Now when you pay the suggested price ($30 USD) or more you will gain 12 month access to the VIP download area where you can download all of Frostsofts current and future plugins including any updates for free for 12 months. Release 1.03 of the Vertex normal tools is now available. This is a minor update that fixes an issue when using C4D r17.048. Fixed bug in C4D r17.048 AddColorChooser "#TypeError: Required argument 'settings' (pos 6) not found" does not seem to be documented but providing dummy bc seems to surfactant. All license holders of VNT are eligible for this fix free of charge and should receive an email with download links for the latest version. If you are a valid license holder of VNT and do not receive an email please contact me. Also wheres the 1.8 update? I know people keep asking this and i keep answering very soon but really it is very very soon and i am working hard on it. :) (found a few more minor bugs that needed to be fixed first and as long as no other bugs comes to light in the final testing it will be approx. a week or two before release).